Cardiac perfusionists are allied health professionals who are trained to operate, maintain, and record the output of a cardiopulmonary bypass (CPB) machine, also known as a heart-lung machine. They are an important part of a cardiac surgical team, which include a cardiothoracic surgeon, anesthesiologist, cardiac care nurses, and operating room technicians. Cardiac perfusionists, also referred to as perfusion technologists or certified clinical perfusionists (CCP), are not physicians or nurses but perform as vital a role during heart surgery. Training typically involves two years of focused studies following the completion of a bachelor's degree program. According to the American Board of Cardiovascular Perfusionists (ABCP), there are over 3,200 certified perfusionists actively practicing in the United States. The core function of a cardiac perfusionist is the operation and management of the heart-lung machine. Perfusionists participate in heart surgeries as well as organ transplants, certain vascular surgeries, and specialized chemotherapy procedures. The heart-lung machine is designed to maintain the circulation of blood and oxygen through the body when the natural blood flow is interrupted during surgery. The machine works by pumping the patient's blood into a membrane oxygenator (which simultaneously oxygenates the blood and removes carbon dioxide) before pumping it back into the body. This replicates the action of the heart and lungs. The cardiac perfusionist shares responsibility with the cardiac surgeon and anesthesiologist for the maintenance of vital functions during surgery. By taking over the normal function of the heart and lungs. the perfusionist provides the surgeon the means to operate on a still, unbeating heart. During cardiac surgery, several thin tubes called cannulas will be inserted to redirect the blood flow. One will drain blood from the vena cava (a large vein that carries deoxygenated blood to the heart) and the other will return blood to the aorta (the artery that pumps oxygenated blood through the body). Depending on the surgery, the cannulas may be placed in other blood vessels or chambers of the heart. The perfusionist may also be responsible for collecting blood from the patient prior to the surgery (known as autologous blood collection) if a transfusion is anticipated. Other perfusionists are tasked with managing ventricular assist devices (VADs) during the recovery phase of heart transplant surgery. In some hospitals, perfusionists are involved in the procurement of cardiothoracic donor organs, including the heart and heart valves, for transplant. As an ever-evolving medical profession, cardiac perfusion offers practitioners the means to specialize in specific procedures or populations. Some perfusionists may opt to work in pediatric cardiothoracic surgical units or in medical centers specializing in heart, lung, or liver transplants. 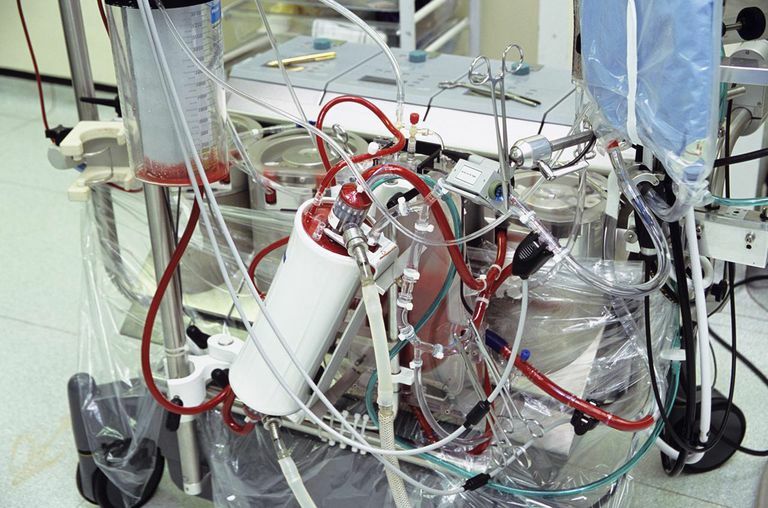 There is even a need for perfusionists who can operate a modified heart-lung machine, called an extracorporeal membrane oxygenation (ECMO) unit, for people with severe heart or lung failure or those awaiting a lung transplant. Additional training is typically required. Although fellowships have been rare, there now several available to board-certified perfusionists who want to expand their education and knowledge base. In some facilities, a perfusionist may be promoted to a senior position and tasked with managing junior perfusionists and perfusionist assistants. In the United States, a four-year bachelor's degree is required to enroll in an accredited perfusion program. Although no specific undergraduate degree is required, a bachelor's degree in chemistry, biology, o allied sciences is most conducive to this field. According to the Commission on Accreditation of Allied Health Education Programs (CAAHEP), there are 17 such programs in the United States. The programs typically involve two years of classroom-based studies with hands-on clinical training. Upon the successful completion of the perfusion program, the graduate is considered board-eligible, meaning that he or she intends to obtain certification but can be employed in the meantime. Some states require licensing to practice. Contact your state's medical licensing board for specific requirements. The perfusionist student must complete a training program with an accredited academic medical center. After the completion of a minimum of 75 assisted CPB procedures, the trainee can take the first of two board exams (covering basic sciences) from the ABCP. After completing an additional 40 independent CPB procedures, the perfusionist can sit for the second exam on the clinical applications of perfusion. After passing the second board exam, the perfusionist will be designated a certified clinical perfusionist and can include the letters "CCP" at the end of their name. Generally speaking, you wouldn't deal directly with a perfusionist prior to surgery but rather with your cardiologist, cardiac surgeon, anesthesiologist, or cardiac care nurse. In most cases, you probably won't meet your perfusionist unless you are introduced in the operating room. The only exception may be during an autologous blood collection or when an ECMO machine is used in intensive care. Even in such instances, the perfusionist will be working under the direction of a cardiologist or a similarly senior medical specialist. As with any medical profession, there are pros and cons to being a perfusionist. On the one hand, cardiac perfusion is one of the more lucrative non-nursing and non-physician medical careers. The position places you at the forefront of one of the more exciting fields of surgical practice in which you will directly interact with surgeons and anesthesiologists as part of an integrated team. According to research published in 2016, the average salary for a perfusionist in the United States is $112,458. Those who manage their own practice have an annual earning potential of more than $145,000. On the flip side, cardiac perfusionists are frequently on-call, which can affect​ your quality of life. This can vary based on the function of the surgical unit and/or the number of perfusionists employed by a hospital, so be sure to investigate this when applying for positions. There is also no denying that cardiac perfusion is a high-stress job in which a patient's health and well-being may literally be on the line. It is for this reason that some perfusionists request assignments in intensive care units or catheterizations labs if the need is great enough. Lewis, D.; Dove, S.; and Jordan, R. Results of the 2015 Perfusionist Salary Study. J Extra Corpor Technol. 2016 Dec;48(4):179-87. Sarkar, M. and Prabhu, V. Basics of cardiopulmonary bypass. Indian J Anaesth. 2017 Sep;61(9):760-67. DOI: 10.4103/ija.IJA_379_17. Sturmer, D.; Beaty, C.; Clingan, S. et al. Recent innovations in perfusion and cardiopulmonary bypass for neonatal and infant cardiac surgery. Transl Pediatr. 2018 Apr;7(2):139-50. DOI: 10.21037/tp.2018.03.05.